We returned home yesterday from a very busy wedding weekend in Texas, and I only filled one page in my Summer Sketchbook. Our friend Kathy is a wonderful gardener, and what I wanted to remember most from our visit with her is the variety of her calle lilies. When our friends are visiting us, and we are taking early morning beach walks, we see and find such interesting things. We usually see skeletal parts of skates, and various fish skulls. There are lots of empty helmet crab shells, and skate egg sacs. This year we even saw one whelk egg case! But this year we also found a bird skull! 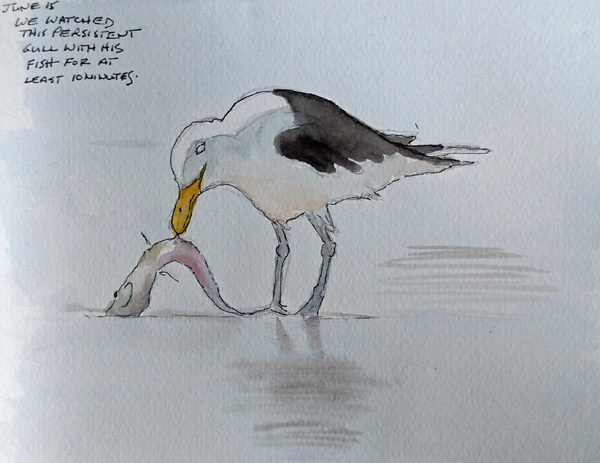 My friend Jeff loves to do the research and using a bird skull identification site, he determined that it was from a "shearwater" bird that lives on the East coast. 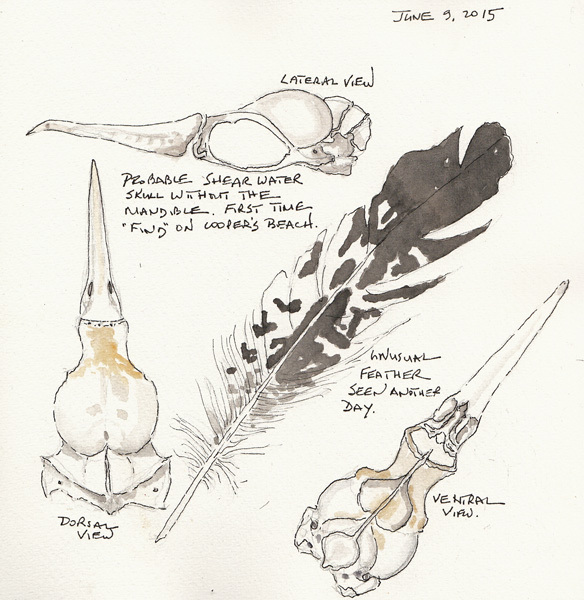 I sketched dorsal, ventral, and lateral views, adding it to my painting of a feather that was different than all of the gull feathers lying on the beach. 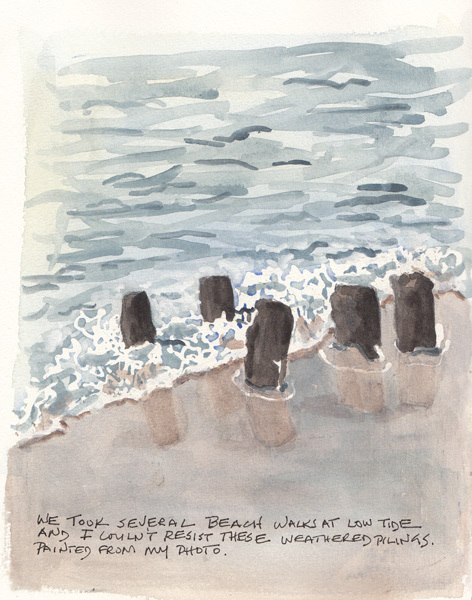 At the end of our walk, 8 of us had coffee on the beach and Jeff's wife Sara and I sketched more scenes from the beach. We had two pairs of birds right above us and next to us, and they definitely did not like the competition and squawked at each other the whole time. The gulls love sitting there watching everyone eat. 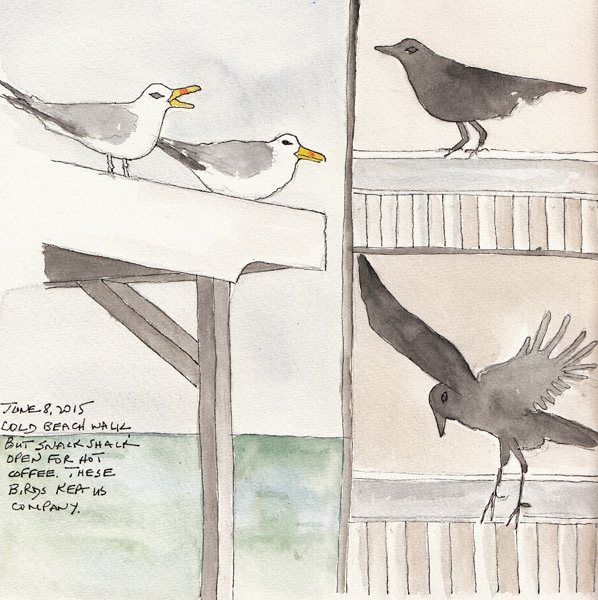 The black birds (crows or grackles?) were newcomers. 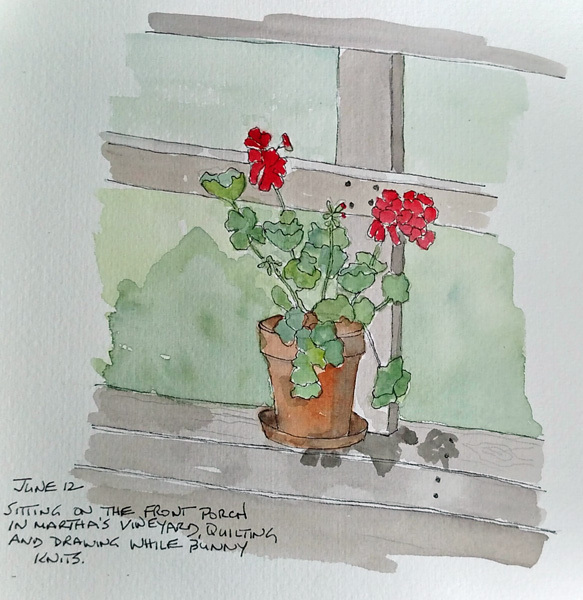 Deliberate Practice: I take pictures of the surf so I can practice with masking fluid when I'm home. We just returned from our Family Weekend at the Beach. One of our children lives in DC and as a group we have increasing difficulty finding a summer weekend that everyone can be together. Our oldest grandchildren are leaving for 7 weeks in summer camp this week and just about when they return, our DC grandchildren will be going back to school. I invited my alien AXEL to join us too. 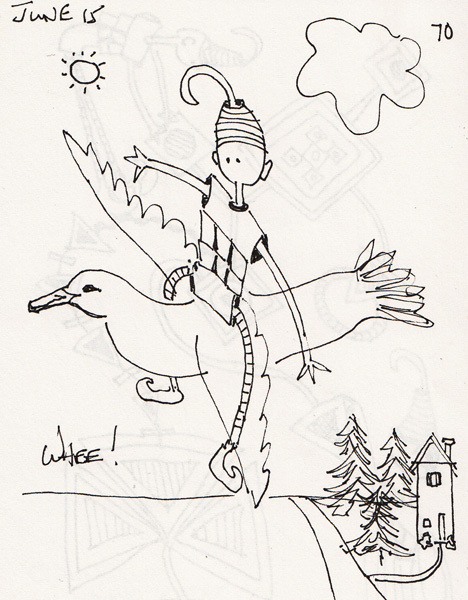 I only did one sketchbook page while we were there. The activity level was way too high to concentrate, but now that I'm home I'll work from a few photos I took. 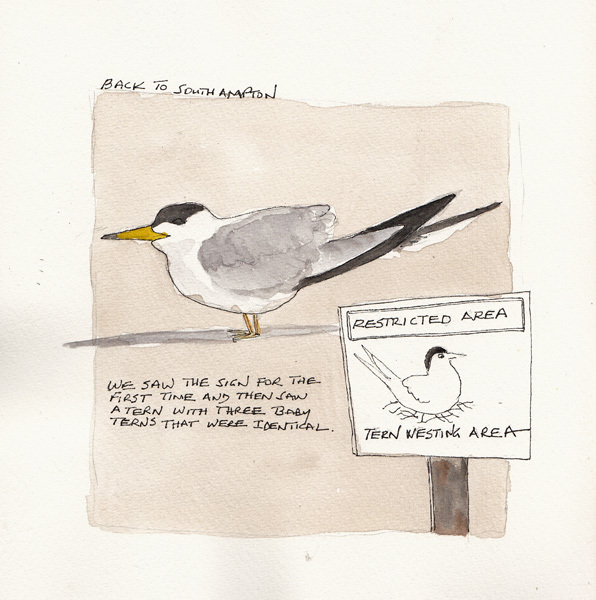 On one of our beach walks we saw an area roped off as a tern nesting area. We are used to seeing this for piping plovers. I wasn't sure that I could recognize a tern, but it wasn't long before a tern and 3 babies were spotted ahead of us on the sand. 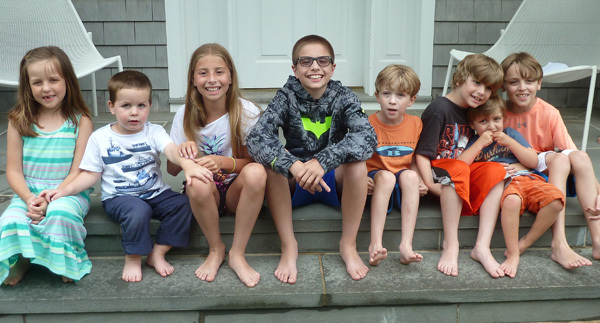 The hardest part of our summer weekend, and holidays when we are together, is to get a photo of all 8 grandchildren. It was starting to rain, and I quickly got them lined up and took several photos. Here they are - ages 2-11! 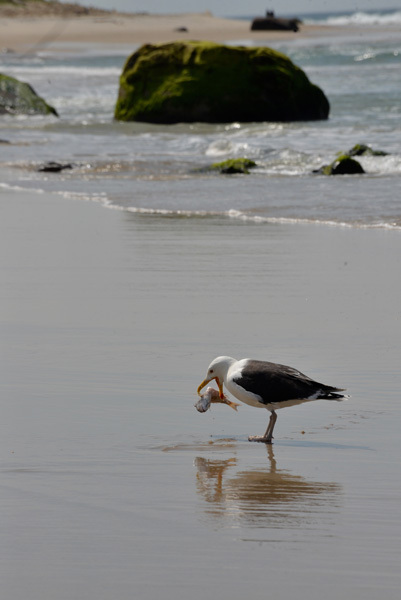 We spent more than 10 minutes slowly walking toward a gull eating a fish in order to take photos. The ones I'm including here were taken by my friend Bunny. Mine taken at the same time were either sky or sand because my camera doesn't have a view finder and my digital screen couldn't be seen in the sun. 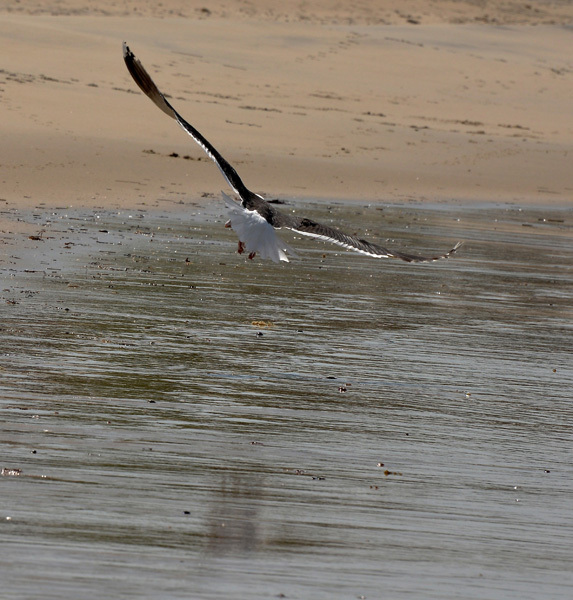 The gull left once, and then returned, finally deciding to take the fish with him. 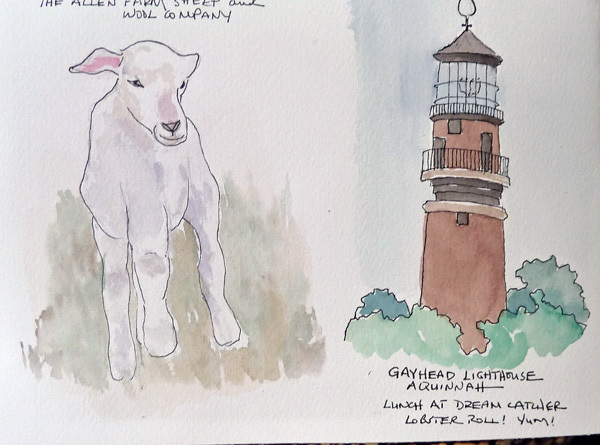 My Remaining Sketchbook Pages from Martha's Vineyard. We fly home tonight and then leave for the Long Island beaches early tomorrow morning to be with with our children and grandchildren. Can't wait! 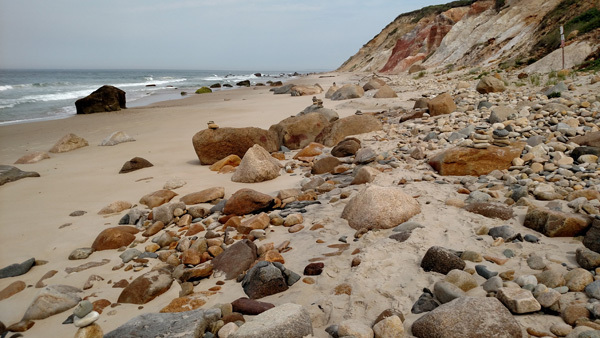 We are visiting friends in Martha's Vineyard, which is a beautiful change in scenery. The four of us met in 1969, and now many years later still visit and travel together. We took 2 beach walks already and the scene couldn't be more different than last week. 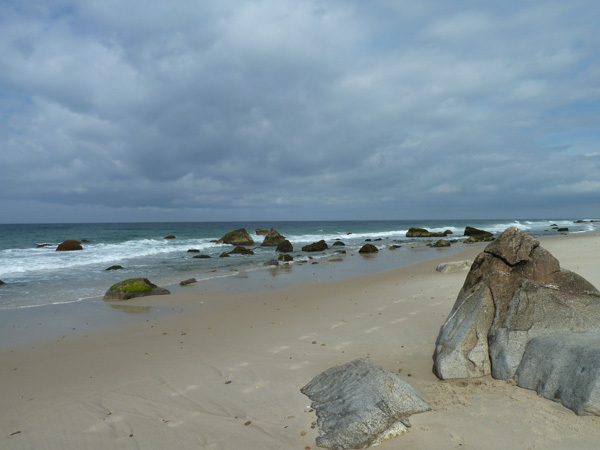 There are gorgeous rocks protruding up from the water and very firm sand for walking. Collecting rocks replaces searching for shells. Here are two photos showing the view as we walked. My grand daughter Sydney and I collect heart shaped rocks, so I still have things to look for! 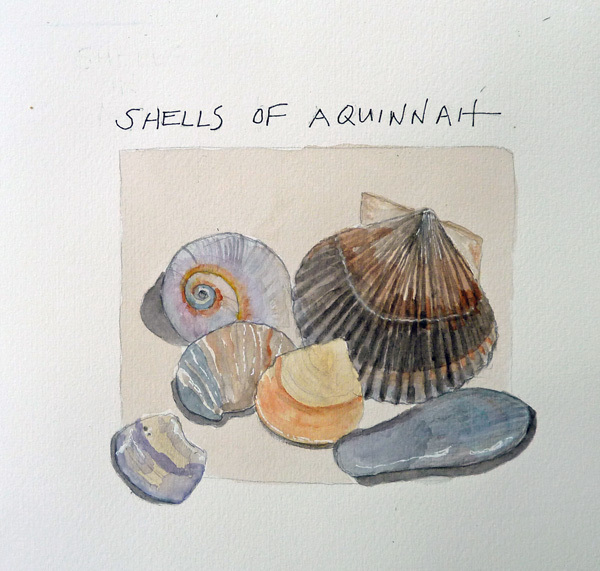 My sketchbook pages are done during the wonderful lazy afternoons at their home. 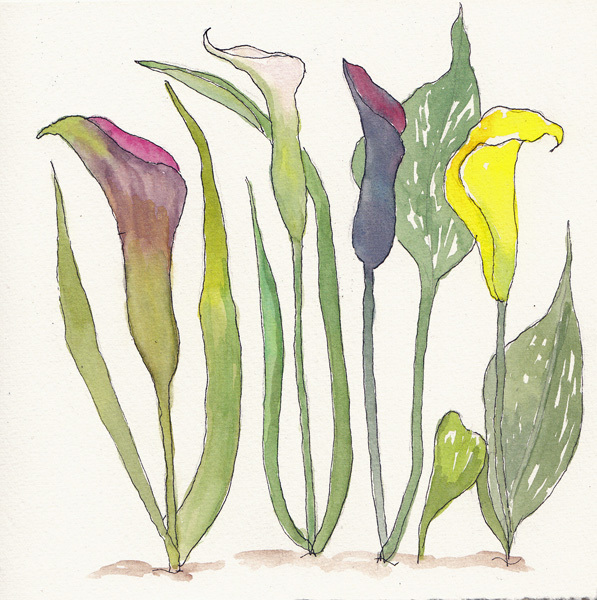 I'm working through a Craftsy class for painting flowers in watercolor, so that is part of my focus. 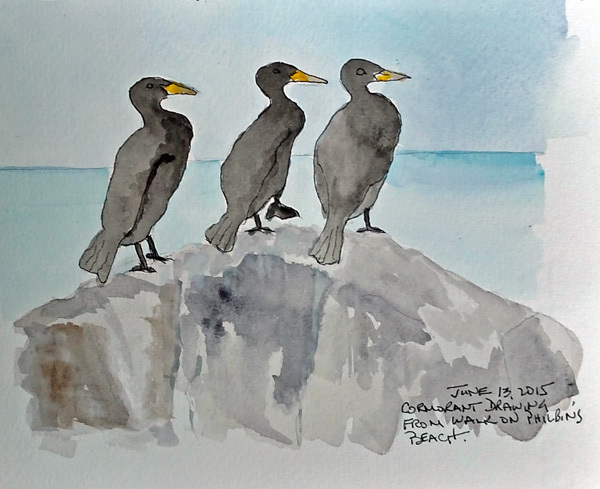 The cormorants were drawn from a photo taken with a zoom lens and then further enlarged on the computer. They may be some of the same ones I painted here last summer. 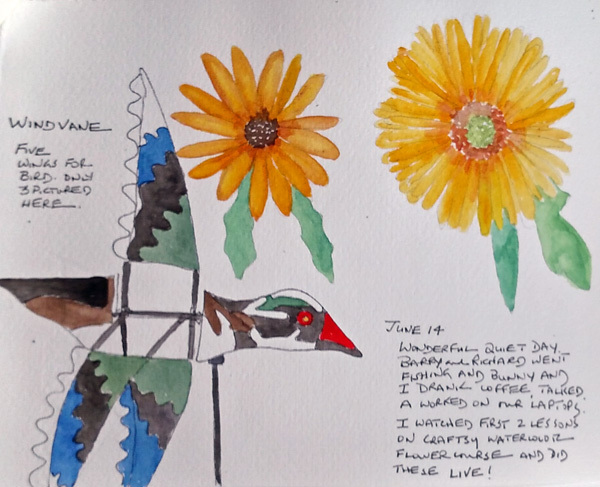 The wind vane bird has 5 wings, but I only drew 3 - too complicated to add in the rest because they were constantly revolving!